Even though I found Thor almost entirely forgettable, and skipped Thor: Dark World entirely, this was an enjoyable slab of comic-book nonsense, benefiting significantly from a dry, understated approach to its comedy. This is likely a result of its New Zealand director, who was one of the men behind the similarly deadpan vampire mockumentary, What We Do In The Shadows. He’s a bit of an unusual choice, given the budget here was over a hundred times greater, but Waititi does a good job of keeping the (inevitably overblown) proceedings at least attached to earth, if not exactly down to it. 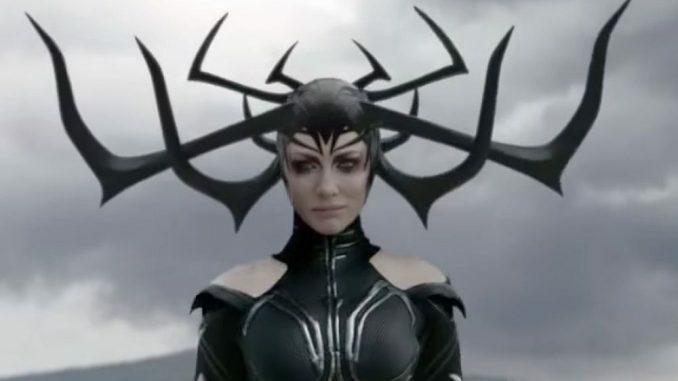 Thor (Hemsworth) is punted from Asgard after the return of his big sister, Hela (Blanchett), who takes out their Dad, and raises an army of the dead (not to mention a gigantic wolf), aiming to bring about the titular apocalyptic thing. Thor goes through a wormhole, hammerless, and ends up on Sakaar, a planet whose ruler is an eccentric megalomaniac played by Jeff Goldblum. 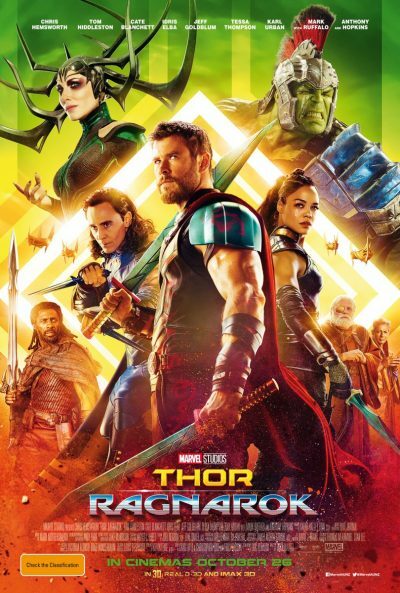 [It’s basically what you’d expect a planet whose ruler is an eccentric megalomaniac played by Jeff Goldblum to be] Thor ends up in gladiatorial combat with the Hulk (Ruffalo), befriends a Valkyrie turned trader (Thompson), and the trio head back to Asgard to take on Hela and her very pointy hat (above). The beginning and end of this are likely considerably better than the middle. Blanchett is great: there’s a reason Hollywood is always happy to corrupt Great British Actresses with a suitcase of cash so they’ll come and slum it in blockbusters like this (see: Judi Dench in The Chronicles of Riddick, Jenny Agutter in Captain America: The Winter Soldier, or Helen Mirren in Red). Besides, anything that gets Zoë Bell back into stunt-work – I’m presuming Waititi played the “fellow Kiwi” card – can only be applauded. There’s a scene depicting the first war between Valkyrie and Hela, which I’d willingly have watched at feature length. Unfortunately, what we get instead is a middle section which is indeed middling: Watching Thor and the Hulk acting like The Odd Couple isn’t why I’m here. It also includes the director dropping a CGI version of himself in to the film, for a somewhat amusing supporting role of little point. It’s a shame, as there is a good amount to enjoy here. Hemsworth is a genuine hoot, playing Thor as a not entirely competent frat-boy, very good at deflating pretension (not least, his own), albeit almost by accident, e.g. “I used to want to be a Valkyrie when I was younger, until I found out you were all women. There’s nothing wrong with women, of course, I like women. Sometimes a little too much. Not in a creepy way, just more like a respectful appreciation.” Even with the equally-amusing Loki largely sidelined, I’d have been happy with Thor and Hela going straight-up, perhaps including a side-order of Valkyrie, and without involving the Hulk at all, who seems a bit of an ill-fit for this Norse-oriented corner of the Marvel Cinematic Universe.